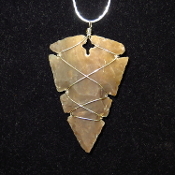 This Agate wire wrapped arrowhead pendant is about 1 1/2 inches long. Each piece may vary slightly from photo. Chain sold separately. This item ships free anywhere in the continental USA. This Amethyst wire wrapped arrowhead pendant is about 1 1/2 inches long. Each piece may vary slightly from photo. This item ships free anywhere in the continental USA. This Rose Quartz wire wrapped arrowhead pendant is about 1 1/2 inches long. Each piece may vary slightly from photo. Chain sold separately. This item ships free anywhere in the continental USA.